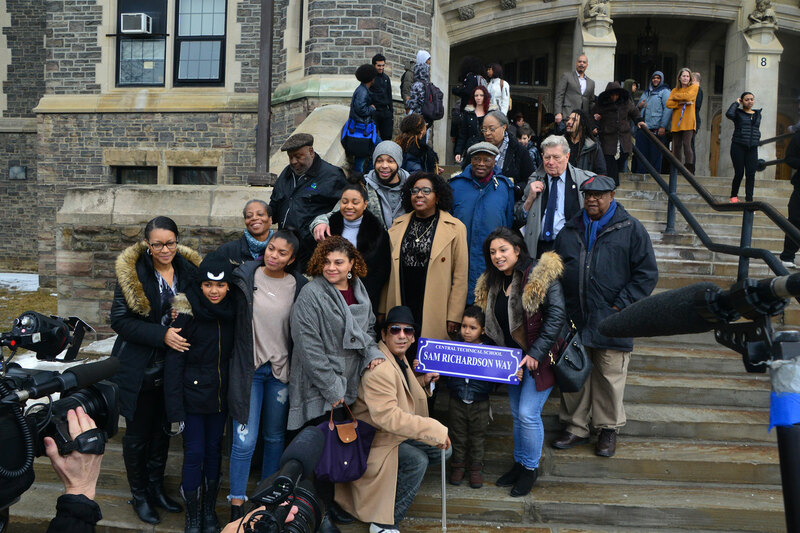 Students and staff at Central Technical School joined the descendants of Sam Richardson to officially declare the school’s front laneway Sam Richardson Way and unveil a new street sign on February 15. The celebration was also one of the school’s events that marked Black History Month. We thought it appropriate to reprint our piece on Sam Richardson, a Canadian Olympian, which we originally published last August. A local boy, Sam Richardson was born on Nov. 18, 1919, to Franklin and Maria of 222 Lippincott St. He went to school at King Edward Public School, then Lord Lansdowne Public School, and finally Central Technical School. It was there that he spent hours training on the track. At that time, he was the youngest competitor to ever win a gold medal in track. A year later, he would set a Canadian record of 25 feet in long jump at the Canadian Track and Field Championships in Winnipeg; a record that wouldn’t be broken for another 25 years. Between London and Berlin, he also represented Canada in France, New Zealand, and Australia. After his athletic career, Richardson began his service at the CBC in 1955 where he worked as a stagehand crew leader on the hit comedy The Wayne and Shuster Show, which aired the same year he started, as well as the children’s television show Mr. Dressup.